Thank you for dropping by for a visit to our website. 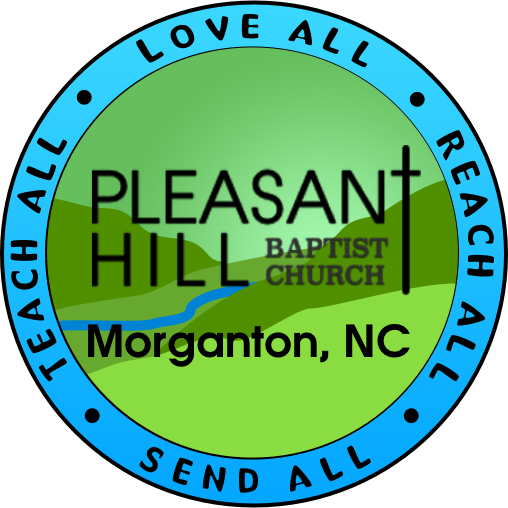 You are cordially invited to drop in on us at Pleasant Hill and experience what God is doing among us. We are a group of imperfect people who desire to worship God, lift up the name of Jesus, Love all, Reach all, Teach all, and Send all of His disciples into a broken world. Come as you are. We are saving a place for you! It is my privilege to lead this amazing church to carry out our vision to lift up the name of Jesus, to preach the Word of God, to reach the lost, and to teach, disciple and ready God’s children to reach out to a lost and dying world. Sound like a great place? You bet it is! Come on out and see. Tuesday, April 16 @ 6:30 p.m.
All Baptist Young Women are invited to our pastor’s wife’s house (He lives there too, but don’t mind him) for our monthly meeting. Check with Shawn or Cathy for directions. Pastor Jack will lead the weekly community of faith Prayer On the Square at the Old County Courthouse in Morganton on this day. Join him and other believers as we intercede for our nation, state, county, and city. Thursday, April 18 @ 7:00 p.m.
Join us at 7:00 p.m. for a special Maundy Thursday service in the Main Sanctuary. Come prepared for an inspiring service and celebration of the Lord’s Supper. Bring your littles (birth-5th grade) to come hunt some eggs. Lunch will be served after the egg hunt. Sunday, April 21 @ 8:00 a.m.
Easter begins with a Sunrise Service on the front steps of the Main Sanctuary, followed by a breakfast together. The Choir will then present their Easter Cantata immediately after breakfast. This year’s special Men’s Retreat will be an overnight event at our Church’s cabin at South Mountain Baptist Camp. You will be hearing more details soon; so begin making plans to join us for this epic men’s retreat. *Note: For a full schedule of events/activities, click on the Schedule Tab above. Romans study - Click on this link. Spiritual Gifts study - Click on this link. The Bible - Click on this link. Want to know how to find out more about following Christ? Click here to go to The Story website. Morning Prayer time - 9:00 a.m.
Sunday School/Bible Study for all ages - 9:30 a.m. Through the Bible Study: Romans - 6:00 p.m.
W.O.R.D. Children’s Discipleship - Off for Summer! Small Groups, Care Team - 6:00 p.m.
Mid-week Study - 6:30 p.m.